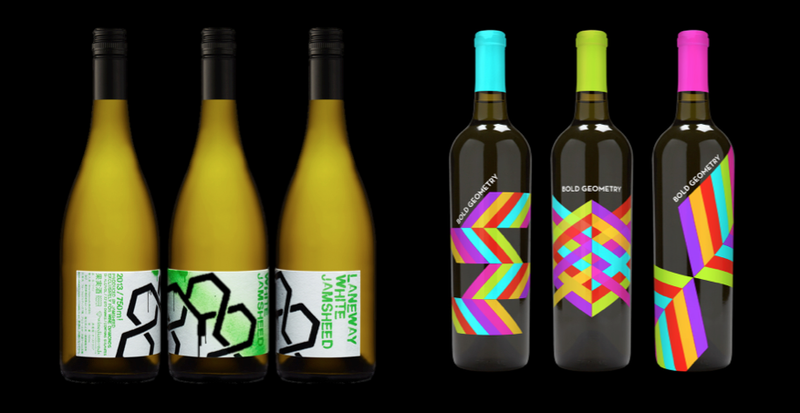 For designers in the food and beverage space, wine is one of the most fun categories to work on. There is generally a lot of creative freedom here, as there are fewer restrictions and standards than there are for other types of products. Elements like nutrition fact panels and ingredients listings aren’t there to eat up space, opening up the bottle as a canvas in a way that you rarely get with consumer goods that have more heavily regulated packages. Millennial buying behavior also plays a role here, as this demographic consumes as much as half of all wine sold in the U.S. and, as a group, is more adventurous in terms of what they are willing to try. This means that wine brands are competing on-shelf to appear visually interesting and exciting, which helps to drive creativity. Rosé in particular has become extremely popular with younger drinkers, and this reality is changing the landscape of wine bottle design. As we recently wrote, rosé manages to walk the fine line of being both a luxury good and relatively accessible from a pricing standpoint. The design needs to reflect this, making consumers feel like they are buying something with a little status and sophistication, without turning them off by making the bottle look like it will be more expensive than it actually is (decent rosé can easily be found for under $12). Consumers also care about their drink looking good on social media, and bottle design that uses attractive colors and type stands a better chance of being selected for what it can add to a dinner’s aesthetics. 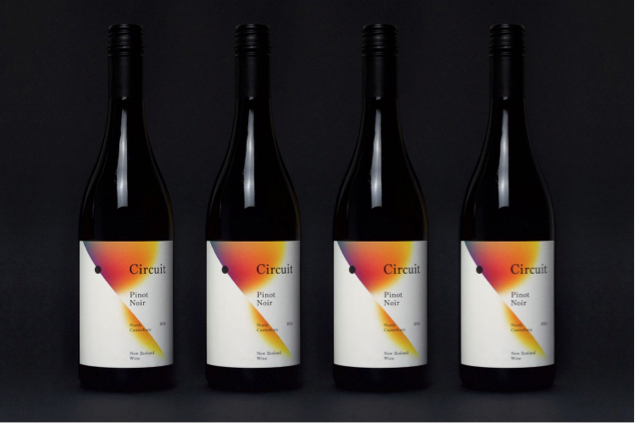 So, despite the anything-goes attitude in wine branding, there are still design trends that emerge and influence the category. 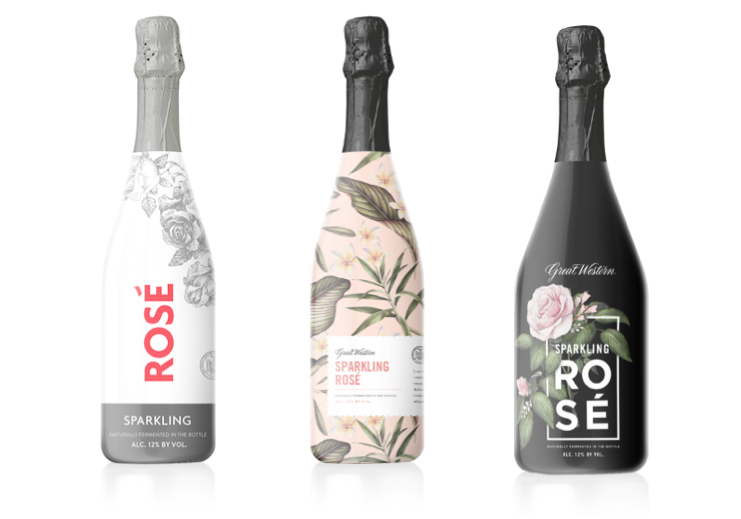 Earlier this year, Works Design (the agency behind this blog) was approached by The Pleasant Valley Wine Company to work on the new Sparkling Rosé from their Great Western brand. After doing extensive research into what was doing well in the industry, we leaned on some of these trends to inspire our own concepts. Below is a series of our interpretations of these up-and-coming trends. Bold shapes are a great way to demonstrate strength without aggression. Interlocking geometry and line work helps the design look clean, while leaving room for playfulness and fun. With this trend, we are starting to see some brands breaking away from femininity and experimenting with more brutal and masculine designs, like the Jamsheed bottle below. In this way, some wine brands are drawing inspiration from craft beer design, which tends to be less concerned with looking “pretty” and is more interested in presenting a story or building a certain vibe. 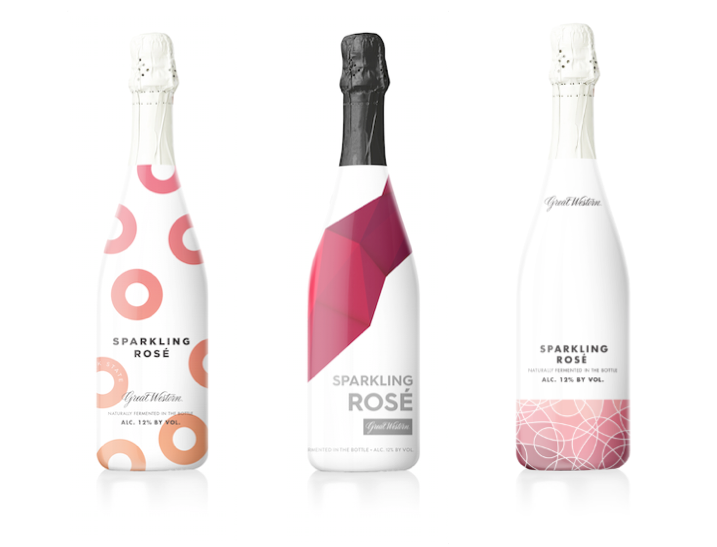 Great Western’s Sparkling Rose is on the higher end of the midrange price/quality spectrum. Given that positioning, Works Design wanted to elevate the bottle to give it a premium appeal, while still keeping it approachable. These were a series of concepts that used geometry very sparingly, with prominent white backgrounds and a lot of air to allow the design elements to breath. This minimalist, white approach – coupled with gradients and geometric shapes – hit on multiple design trends in the space, while giving the bottle visual distinction on shelf. This retro trend has been creeping back into package design across a range of categories, from snack bars to juice to wine. Gradients offer more flexibility and options than working exclusively with flat colors, and they are also effective for designers looking mimic the way that colors flow together in nature, as with fruits, plants, sunsets, water, fire, etc. These can look more juvenile when done completely in flat colors, and gradients can elevate the realism of a design and make it more emotionally resonant. Gradients first started to really come back across all design disciplines in 2014, as a response to the overuse of flat colors in web design following updates by Google and Windows. Today, some of the most popular apps like Instagram and Spotify incorporate gradients into their branding, and we have seen similar changes throughout different product categories. Here, Works Design really went all out on this trend, as gradients heavily used in three different concepts. The first was intended to give a minimalist pop of prominent purple gradient color, with little embellishment. The visual theme from the geometry concepts of restraint and breathing space is carried through to this design. The idea behind it was to allow the bottle to really stand out on shelf, but still maintain a modern, clean look and feel. The second concept feels more approachable, with subtle use of gradients and nuanced design elements, including shapes, colors, etc. The third concept almost communicates a holiday feel, but in any event intended to deliver a festive and celebratory tone while incorporating gradients as a recessive background element. This trend is especially popular for rosé, for obvious reasons. 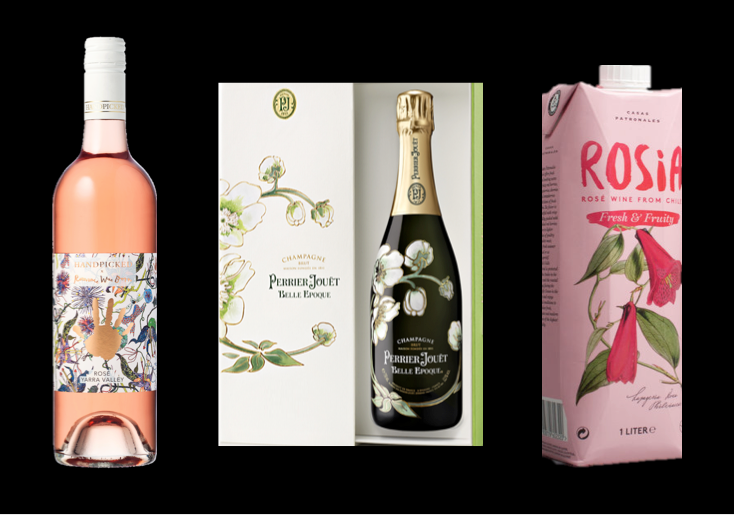 With the wine’s flowery name and feminine pink hue, floral designs make sense and work well. Flowers can also be used to reflect tasting notes in different kinds of wine – for example, many sauvignon blancs have notes of irises, and acacias are often found in sparkling wines. When brands look to tasting notes for design inspiration, they can turn to perfume makers for guidance, as it’s always been pretty standard practice to include scent notes in the package design. For both wine and perfume, illustrating the product’s notes can help make psychological associations and target desired consumers without the need for sampling. This is especially significant information to convey with e-commerce, as the shopper will not interact with the product until they receive it. Plus, flowers just look good for social media. Again, this can be important. Though these all feature illustrations, these are three totally different takes on the floral trend. 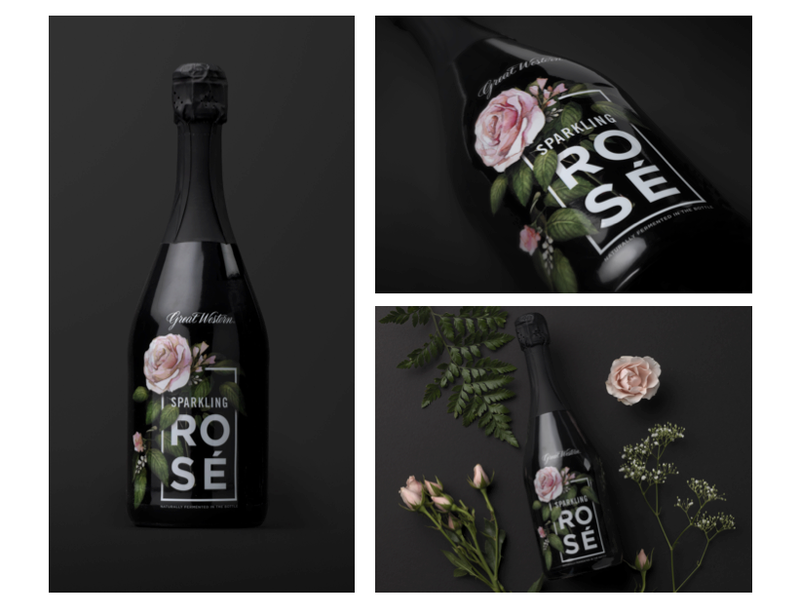 The first concept is very modern and white, with the illustrations set in a washed-out gray to allow the bold “rosé” label to really pop. 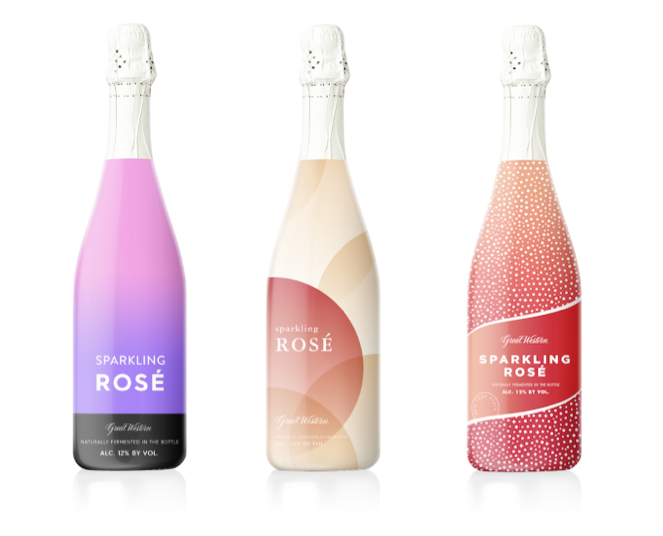 The second concept is the most elegant and feminine, keeping in line with more traditional rosé design. The final concept is clean black, with the floral elements superimposed over the stacked text to create depth. Both of these are prominent design trends at the moment. The client chose this design because of its modernity and its ability to jump off the shelf at retail with contrasting colors and large stacked text. Works Design created custom illustrations for the final package. Head to the Works Design Group site for more information about this project and to see more of our work. To contact Works Design, reach out at info@worksdesigngroup.com.